Located in the northwest corner of Washington State, the Olympic Peninsula constitutes one of ten World Heritage Park areas. 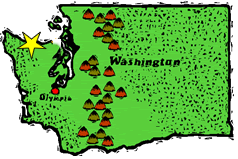 Every year, over three million tourists visit the Olympic Peninsula; many leaving with suitcases full of fresh Alder smoked salmon. 1. Find the Least Common Multiple (L.C.M.) of 7,8,9,21. 2. Find the Greatest Common Multiple (G.C.M.) of 63 & 217.